The initial assessment will last for approximately 90 minutes. During this time Sam will take a full case history of your animal, including any medical history and the details of the current complaint. It is important that the patient be handled by his/her owner or a competent handler appointed by the owner. If possible the gait of the animal will be observed at different paces, and on different surfaces to identify any abnormalities in movement. The animal will then be assessed by palpation of the soft tissues and joint range of movement. 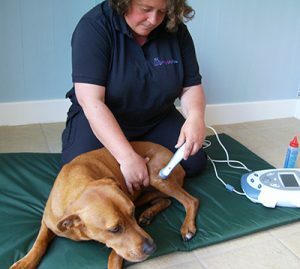 A rehabilitation plan will then be developed which is specific to your animal’s requirements. Depending on the condition to be treated, the number and frequency of treatments can differ greatly. If appropriate, Sam will demonstrate manual therapy exercises that can be carried out on your animal in between physiotherapy visits. Input from the owner between sessions can provide some of the best outcomes in the rehabilitation process. In order to give a thorough assessment and provide appropriate treatment, consultations are not set to a defined time limit. Appointment durations will depend upon individual cases. Veterinary Physiotherapists will obtain veterinary referral or veterinary consent before carrying out assessment and treatment. This is a legal requirement of the Veterinary Surgeons Act 1966 in order to protect your animal.